This noodle salad is a new favorite in our house! It is bursting with Asian flavors from the juicy marinated eggplant and fried tofu. It is nice and quick to make too, especially if you marinade the eggplant in advance. Perfect for busy weeknights. I love this new way to prepare eggplant. It is very versatile. For instance, you could also use it as a filling for sushi. Add the cubed eggplant to a bowl with the vinegar, soy sauce, sweetener and garlic. Give it a good mix, so everything is covered with the marinade and let it sit for at least 10 minutes. If you want, you can do this several hours in advance. Drain the eggplant, but keep the leftover marinade to use later. In a non-stick skillet, cook the marinated eggplant cubes in the sesame oil on medium heat until browned and completely tender. Turn them every few minutes so they cook on all sides. Whey they are almost done, you can pour some of the marinade over them so they get nice and juicy. Also keep some of the marinade for the dressing. In the mean time, fry the tofu cubes in the neutral oil until brown and crispy. When it is done, add the soy sauce and give it a good mix so the tofu absorbs the sauce. Set the tofu aside. Prepare the noodles of your choice according to the instructions on the packaging or to preference. For instance, you may want to give zucchini noodles a quick stir fry. Mix in the leftover eggplant marinade as a dressing. You can also add a bit of extra sesame oil if you like. 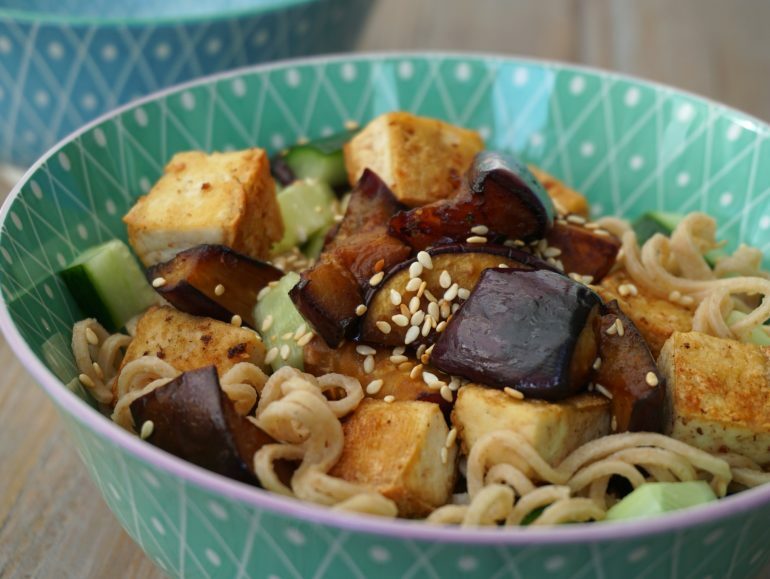 Divide the noodles over two bowls and put the eggplant, tofu and cucumber on top. Sprinkle on the sesame seeds and fresh herbs, if using. I would also like to know the nutritional info (specifically carbs) for this dish. Thanks! On closer examination of the recipe, I see why you could not include the nutritional info. Much will depend on what type of "noodle" you select. Thanks so much for creating this website!